On the day on which we celebrate the memory of St. John the Wonderworker, Archbishop of Shanghai and San Francisco, we offer the following selection of decrees (ukazy) and instructions written by him. Although written in the formal tone of official documents, upon careful reading they reveal a great deal about the saint’s pastoral approach and general sensibility. Decree No. 39, September 23, 1951. 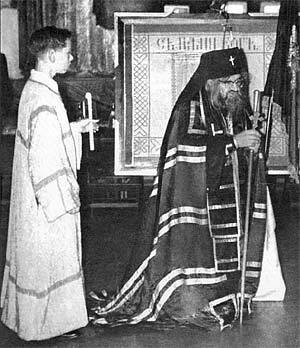 Clergy are reminded that only persons belonging to the Orthodox Church are to be commemorated at the Divine Liturgy, inasmuch as such commemoration makes the persons commemorated participants of the divine service, in which only Orthodox Christians may participate. Similarly, those who have consciously committed suicide may not be commemorated, as they have left the Church of their own will. In their private prayers, however, Orthodox Christians may pray to God for all, hoping in God’s mercy. Decree No. 223, April 23, 1953. Sojourning in the diaspora in countries where, in olden times, holy God-pleasers labored and were celebrated for their suffering or other ascetic struggles and have been revered by the Orthodox Christian Church from ancient times, it is fitting for us to honor and turn to them, without at the same time growing cold towards those holy God-pleasers to whom we have previously turned in prayer. In various places of ancient Gaul (today’s France) and other countries of Western Europe, the sacred remains of martyrs from the first centuries and following who were confessors of the Orthodox faith have been preserved to the present. We call on clergy to commemorate at divine services – at the litiya and in other prayers – those God-pleasers who are the patrons of the place or country where the service is taking place and are especially revered, as well as at the dismissal. In particular, in Paris Hieromartyr Dionysius, Venerable Genevieve, and Venerable Clodoald should be commemorated; in Lyons, Hieromartyr Irenaeus; in Marseille, Martyr Victor and Venerable [John] Cassian; in Toulouse, Hieromartyr Saturninus, Bishop of Toulouse; in Tours, Holy Hierarch Martin. In cases of uncertainty or confusion, we advise you turn to us for clarification and guidance. The flock is likewise called upon to honor these God-pleasers. Having the renewal of human souls and their conduct towards the eternal Kingdom of God as the main goal of their ministry, those who have received the gift of the priesthood should not be distracted from their apostolic work and waste time on worldly affairs. That which a priest gives to people cannot be given by anyone else, and nothing can be compared with the eternal good to which he leads people. Therefore, clergy should not dare be distracted from their direct responsibilities by engaging in even beneficial worldly affairs, remembering that he is a guardian of human souls and will answer at the Dread Judgment for every sheep that has perished through his negligence. The Apostles gave an example of this when facing the disputes among the disciples concerning the ministrations of aid, saying: It is not reason that we should leave the word of God, and serve tables [Acts 6:3]. Church canons strictly forbid clergy to engage in worldly cares and to assume public office. This, however, does not mean that clergy can completely withdraw from all worldly affairs. People are made of soul and body; it is impossible, while taking care for the soul, to forget completely about the needs of the body. The Lord commanded us to show love to our neighbors in acts of charity, about which we will be asked at the Dread Judgment. 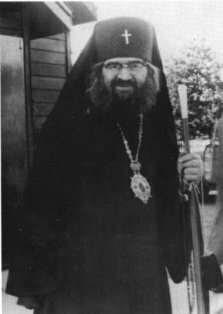 Many holy hierarchs and monastic saints were active participants in events that took place in their times, sometimes even heading governments. But that occurred when brought about by urgent necessity. When it is necessary to save people in disasters, or when a pastor must participate in order to instruct them on the right path, he ought not dare remain indifferent. He not only can, but must come to their aid. This applies both to private and common affairs. It is the duty of the pastor to encourage people to engage in philanthropy and, if necessary, for him to become the head of philanthropic foundations and to direct public affairs in accordance with the spirit of Christ’s teaching. Yet all the while, he must always remain a clergyman and pastor. Joining any party, with submission to its discipline, in unacceptable. It is also inappropriate for a pastor to become immersed in the purely mundane side of public affairs. Everything that can be done by the laity should be left to them, while the pastor’s work is to strive to concentrate on spiritual matters. The priesthood is the light of the world, and its participation in public life should consist of sanctifying the way of personal, public, and state life. The clergyman’s duty is to indicate the moral foundations upon which society should be constructed and to inspire its activity, imbuing it with the spirit of Christ’s teaching. Himself not descending into the thick of daily cares, the pastor must hover above his flock, vigilantly watching over it, descending when those weak in spirit or body need support, to prevent and confront evil, to encourage good deeds and ascetic struggles, and to fortify works of good. 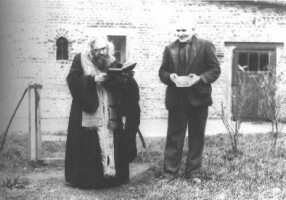 The most sublime and important gift of the clergyman to the community is his calling to send down upon them the blessing and grace of God, for which the pastor must be especially diligent in prayer and, remembering that he is above all a servant of God, to be an example of the believers, in word, in conversation, in charity, in spirit, in faith, in purity (1 Timothy 4:12), and in prayer, example, and instruction to lead them to the Kingdom of God. Decree No. 70, November 8, 1951. For more active and effective participation of the faithful in the divine services, rectors of churches and all clergy are encouraged to attract the laity as much as possible to read and sing on kliros, as well as boys and young men to serve in the altar during divine services. In addition, they are instructed to introduce the singing, if possible, of certain parts of the divine services, or even their entirety, by all the faithful, in imitation of the ancient Church. It goes without saying that the common singing of the following should be performed on all Sundays and feast days: at the Liturgy, the Creed and the Our Father; and at the All-Night Vigil, when appointed, “Having beheld the Resurrection of Christ.” To enact this it is useful to send a part of the choir into the middle of the church and for the deacon or the choir director to guide the singing. Decree No. 424, December 29, 1954. If invited to testify regarding some event or incident that a priest saw as a casual observer or that he knows in common with other people, he can and should give testimony as a witness. If, however, the authorities propose that he testify to something that he knows through his pastoral position or activity, then a priest should not be a witness on such matters, for anyone can approach a priest as a spiritual father without fear that something will become known to outsiders. 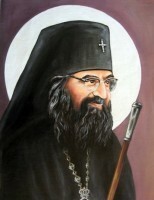 In the case that the authorities require elucidation of some event of public or church life and propose that a priest give evidence, the latter should declare that he is not authorized to do such; he should suggest that they appeal to the ecclesiastical authorities, who can always give appropriate explanations. Decree No. 489, October 8, 1955. 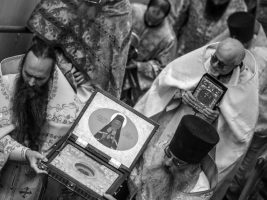 Clergy are reminded, for unwavering and exact compliance, that the church canons prohibit the commemoration at the Divine Liturgy of suicides, as well as the performance of funerals and the serving of panikhidas for them. In cases when the person had previously been in a home for the mentally ill or when there were other exceptional circumstances, it must be submitted for the consideration of the bishop; without his permission no one should dare to perform sacred rites self-willfully. The holy canons decree that Christians should spend the eves of feast days in prayer and reverence, preparing for participation or attendance at the Divine Liturgy. If all Orthodox Christians are so called upon, then all the more does this directly concern those who participate in the church services. Their participation in entertainments on the eves of feast days is especially sinful. In view of this, those who are present on the eves of Sundays or feast days at balls or similar entertainments and amusements cannot participate the following day in the choir, serve in the altar, enter the alter, or stand on kliros. It behooves one always to remember and recognize that church singing is prayer and that the singing of prayers should be performed reverently, to evoke prayer in those standing in church. Unacceptable are melodies and hymns that are pleasing only to the ear, but in content or execution are not conducive to prayer or, likewise, do not correspond to the given divine service or event celebrated on that day by the Church. At the same time, the behavior of those singing should be reverent and in accordance with the high calling of church singers, who unite their voices with those of the Angels. Supervision thereof is the responsibility of those leading the singing and of the clergy celebrating the divine services, whose instructions should be carried out unquestioningly. Clergy, and especially church rectors, are obliged to pay attention that no one wearing lipstick venerate the icons, cross, or anything sacred, leaving on them a trace of lipstick. It should be posted at the church entrance and repeatedly explained in sermons how great a sin it is for persons to defile holy things with unclean touch; how those going to church should clean off the lipstick or else not venerate anything; and never to partake of the Holy Gifts of Christ without having thoroughly cleaned their lips. What is altar serving in church? Altar serving in church is a reasonable service of sacrifice to God in church by those who do not possess the higher orders of the priesthood. How is this sacrifice and service to God manifest? 7. From their spirit: fervent inward prayer. Serving in the altar is serving God, inasmuch as it participation in the service of God. Altar servers should remember that they are not serving the bishop or the priest, but the Lord God Himself, Who accepts the service and doxology of a countless multitude of angels, but nonetheless, in His goodness, also accepts our heartfelt service, like the widow’s two mites. Therefore all duties and responsibilities at divine services are sacred and honorable. Altar servers should be aware that they are being granted the greatest of honors: to take part in the service of the King of kings, Whom even the angels serve with trepidation. Who do the altar servers represent in the divine services? Inasmuch as our earthly divine services are an image of the heavenly divine services, the bishop represents Christ Himself; the priests represent the Apostles; the deacons represent the Seraphim and Cherubim; and the altar servers represent the Archangels and Angels, who invisibly served Christ during His earthly life and eternally glorify Him in heaven. Therefore, just as the angels in heaven keep strict order, with the younger subservient to the older, so too should very strict order be kept among altar servers. The younger should unquestioningly do what they are told by their seniors, just as the angels speedily perform orders given them by the senior angels. At the same time, one should not seek out seniority, remembering the Lord’s words: Whosoever will be great among you, let him be your minister; And whosoever will be chief among you, let him be your servant (Matthew 20:26-27). We should willingly carry out every work entrusted to us, so that we may hear from the Lord: Well done, thou good and faithful servant: thou hast been faithful over a few things, I will make thee ruler over many things: enter thou into the joy of thy Lord (Matthew 25:21). 1. In order to serve in the altar one must receive a blessing from the priest; or, at a hierarchal service, from the bishop. 2. Come to church before the beginning of the service. 3. Entering the altar, one must cross oneself facing the Holy Table and make three full prostrations on ordinary days, or bows from the waist on Sundays and Feasts of the Lord. 4. Those who are not serving are forbidden to enter the altar. 5. Only those intending to serve may enter the altar. 6. Ties should be removed before vesting in the sticharion. 7. After removing the sticharion, one should fold it neatly or hang it in its place. 8. In the altar one must not converse, laugh, or run around the church; moreover, one may not eat anything during the service. 9. All readers and altar servers should wear the sticharion. In order to remove the sticharion, one must receive a blessing from the priest; or, at a hierarchal service, from the bishop. 10. Altar servers remove their sticharion when communing of the Holy Gifts, except for readers. 11. Do not touch the Holy Table or the Table of Oblations. 13. One’s hands should be clean before putting on the sticharion. 14. No items unrelated to the divine services should be kept in the altar or vestry. 15. It is not permitted to sit while wearing the sticharion. 16. Before exiting with the candle and ripdia, altar servers should cross themselves before the icon behind the Holy Table and bow to the bishop or priest standing before the Holy Table. Upon reentering the altar, the altar server does the same as before exiting. 17. One needs to remember that the altar is a most holy place, and one needs to stand in it with special reverence, and passing by the High Place in the altar one must cross oneself, and follow the service attentively. 18. During the Creed and the Our Father all altar servers exit onto the ambo for the common singing. 19. During the Communion of the clergy, all altar servers stand reverently in the altar, and before the sermon they all go onto the ambo to listen. 20. Those who violate the “rules for altar servers” will stand on the left kliros until the completion of the divine service. Translated from the Russian found here and here.